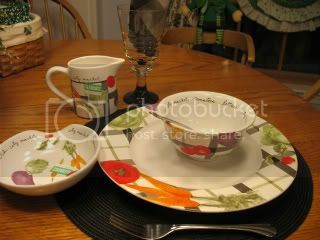 Cuisine Kathleen: Tablescape Thursday City Market..
Tonight I am featuring my City Market pattern by Pfaltzgraff. I got them 2 yrs ago in a Pfaltzgraff clearance center, that has since closed. 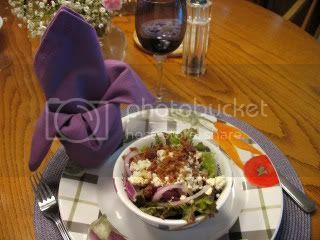 There are many colors in them, so you can change the look with the napkins and placemats...I have dinner plates, soup bowls, pitcher and little bowls..I think I have a sq casserole tucked away somewhere too! 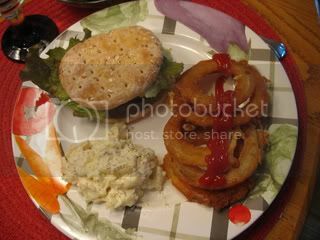 The plates were 2.00 each..
You can see them better here.. Thanks for coming, and please see the other entries at Susan's. My dear friend, Anne, passed away, so we have been gone for the wake and funeral.. It has been a very sad time..Her dau is expecting her first child and has been hospitalized with Guillain-Barre Syndrome. So if I may ask again, please pray for this family..my deepest thanks! Hi Kathleen! Love it all the table the food! I'm coming over! The different color "accessories" completely changes everyting! 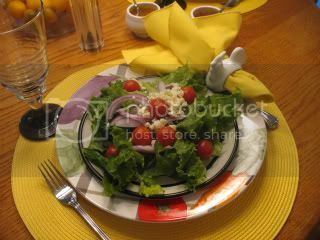 What versatile dishes! That's neat the way you use the different colors. It's hard to tell it's the same plates. Very inventive... i like d this post... I also like and am looking forward to let there be while again! It was a huge hit! Ann's family is in my prayers. O, dear one..I am so sorry for the loss of your friend. Please know I will add them all to my prayer list..and for you, too. It is a hard thing indeed to lose a friend. I luvvvv your dishes. How pretty they are. I know you must really enjoy using them. I am so excited to see that your are having another "WHITES" party. I will surely be there! Thanks so much for giving us the time to get our post together. I missed out on your first white party so I'm eager for the second. Must there be another color w/ the white or is it no more than one other? Oh boy! Let there be white part 2. I'm looking forward to that. Love that city pattern. Fun with the different colors and plates and patterns added in. 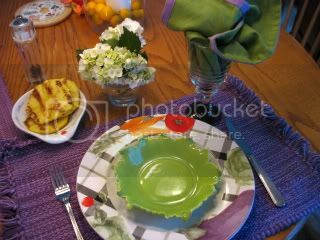 I have to say I got a little distracted with the fabulous looking food on those plates. Yummy looking. 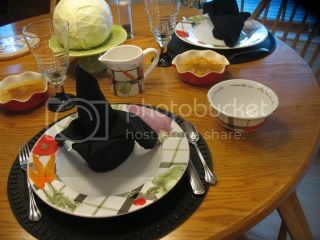 Kathleen, I love the City Market dinnerware ... it's so colorful and versatile. Sending prayers and positive thoughts for Anne's daughter. You know, I like them all, but the yellow and purple placemants, and particularly, the Bishop's Hat (or is that the Lily? 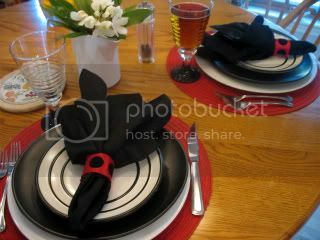 ), in any case, they're two of my favorite napkin folds. They really bring the whole table to life. Kathleen, I'm sorry to hear the sad news. Please accept my condolences for the loss of your friend. I finally made it to your blog on time to comment. Firstly, so sorry to hear about your friend. Hope things work out well for her daughter. Now, for the tablescape. The veggie plates are soooo cute. And I love the cabbage you used as the centerpiece. :) Very cute. 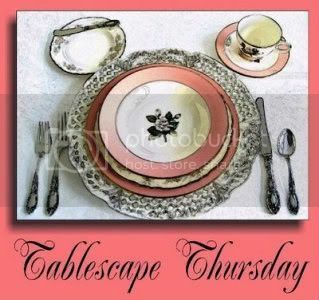 Mo (from the tablesetting forum). I have to say I like the drama of the black with your dishes. It's amazing how they change when they are paired with different accents. Kathleen, I am so sorry about your friend and about her daughter and expected grandchild. This has been a sad week for you. I will be praying for them. I love all the looks! They are chameleons. Sending a big hug your way my friend. I like all of them, but I think my favorite is the purple! I love that pattern. Too bad the outlet closed! Very versatile and so pretty! What a versatile set of dishes! They are perfect for all the colors you have shown! I just couldn't choose a favorite, they are beautiful with them all! Great buy, great find! What a great set of dishes! You can use them so many ways - it's amazing. So sorry to hear about your friend Anne. Hope to get together again soon! 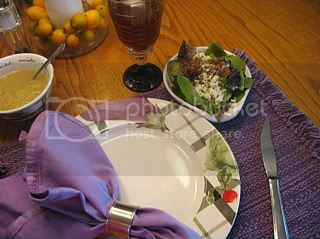 Love the plates - you can literally put any color with them.. You make everything look so pretty nd elegant! !